I was sitting there doing what I normally do (driving a truck going down the road, talking to myself), and thought. Damn! Didn't Microsoft have some kind of anti-trust suit going against them some time back? I know it was about browsers, but isn't this signed certificate for the firmware to allow the computer to boot even MORE intrusive? Who in the world on the consumer side of things is asking for this kind of crap? Who on the IT side? This certainly seems to be more of Microsoft's line of thinking that if you're not paying them homage, tribute, or some portion of YOUR money, to run YOUR computer, with YOUR software, they have some right to your pocketbook, just because, they're Microsoft. I can see where XScreenSaver will be my Screensaver of choice from now on. 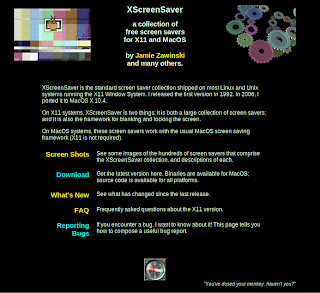 Not that Gnome-Screensaver didn't do it's job properly, it's just that it seems to be a dumbed down XScreenSaver. Why would I want that? Maybe, as time goes on, I'll see why there is a Gnome Version. But, really, I don't know why the Gnome team seems to have the habit of pulling the buttons off of things.